If you are living with a failing tooth, you understand the impact it has on your overall health and well-being. Chewing and eating becomes difficult and sometimes even painful, while smiling and talking to other people may make you feel self-conscious. You’ve heard about dental implants, but you have a lot of questions. A dental implant consultation is a great place to start. We’re also going to share information here on what an implant is and how it can benefit you, so read on. 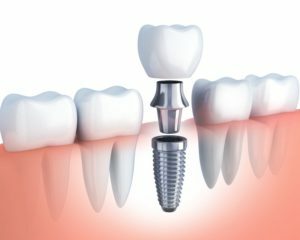 The dental implant is made of biocompatible titanium, which naturally integrates with your bone over a period of 3 to 6 months through a process called osseointegration. This allows the implant to become a stable foundation for your new tooth just as your root was. The crown is made of ceramic porcelain, which is customized to match your missing tooth and blend naturally with your smile. Because your new crown is also durable, you’ll enjoy all the functions of eating and chewing that you lost with your tooth. Brushing and flossing can also be done with ease since your implant provides both the look and feel of a natural tooth. Dental implants provide a benefit that no other tooth replacement option can deliver, and that is they protect your oral health because they replace both your root and tooth. Your jawbone begins to deteriorate when your tooth is lost, and this affects the health of your surrounding teeth and also changes the appearance of your face. A dental implant keeps your bone healthy and your implant crown keeps neighboring teeth from shifting. Dental implants also provide excellent longevity, as well as boasting a 95% success rate. They can potentially last for a lifetime with a great home care routine and regular checkups with your dentist. Even if you are missing multiple teeth, dental implants can help because they can be used to support dental prosthetics such as a denture or bridge. Implants provide those who wear dentures a more secure fit, while also promoting longevity for the denture by preventing bone loss. If you are interested in learning more about dental implants and if they are the right treatment for you, please contact your dentist in Syracuse to schedule a consultation today. When you come to Creative Dental Concepts for your dental care, you will notice right away that Dr. Gregory Craybas and Dr. Donald Crumb strive to provide their patients with a personalized experience that is designed to exceed expectations at every visit. If you are interested in dental implants, our team will guide you through the process from start to finish to ensure the best outcome for your oral health and your smile. If you would like to contact Creative Dental Concepts, we can be reached by calling 315-475-6641 or through our website.